The Phantom Ray is the first unmanned fighter drone that doesn't need a pilot on the ground controlling it. Boeing. Boeing’s sleek fighter-size Phantom Ray stealth jet will make its first flight by year’s end. 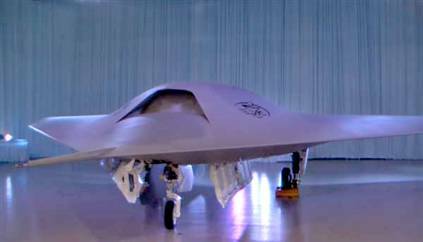 This unmanned airborne system is designed for a variety of warfighter roles ranging from reconnaissance and surveillance to aerial refueling, electronic attack and hunter/killer missions. The 36-foot-long aircraft, which will serve as a test bed for advanced technologies, was rolled out May 10 at the Boeing Defense, Space & Security plant in St. Louis, Mo. With its 614-mph (0.8 Mach) cruising speed, operating altitude of 40,000 feet and 50-foot wingspan, the 36,5000-pound Phantom Ray advances the state of the art for unmanned aircraft. The bat-shaped flying wing has a combat radius of 1,200 nautical miles. Power comes from a General Electric F404-102D engine. wait..how much does it weigh?